It was once said by someone dear to me that I am a man of many half-baked projects and good intentions. At first I tried to deny it, making excuses for my failure to follow through with my many plans but then I finally had to admit the truth. The older I get the lazier I become. Oh, not lazy in the sense that I'd let the house fall down around me. And not so lazy that I'd let the lawn go wild when it needs a good mowing. But lazy with the things that might indicate that I'm not just content to exist and get by in life. I'm jealous of people who make the time to work, keep up a house, AND still develop other interesting hobbies. I realized how lazy that I've become when I stepped out back to take a picture tonight. The moon was shining through the limbs of an old oak in my back yard that threatens to fall on the house some day. I've been meaning to cut it down for two years now. I hadn't really given it a thought until I looked at the pictures that I took. I actually climbed up in that tree 18 months ago, cut two limbs, got tired ( or was it scared? ), climbed down, and put that on the back burner for a while. Well, one thought leads to another and while I was looking at the picture of that tree I couldn't help but notice the things in the pictures above. 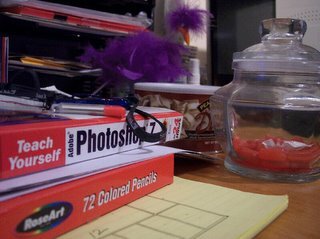 The "Teach Yourself PhotoShop" book, the box of 72 colored pencils, my Roland keyboard. TROPHIES every one of them! I bought the keyboard because I always wanted to play the piano. Not just peck at the keys but really play! Do I practice often? No! Do I pay for piano lessons? No! I taught myself to peck out a few strains of The Andy Griffin Show theme. That's it, nothing more. I bought a beginners book and fooled around with it for about a week. 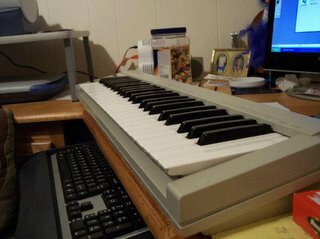 Now that keyboard serves as boredom relief for the oldest grandson when he comes over. I bought the colored pencils because I was going to try to live up to my familys' ascertion that I was some sort of artist. Maybe I was twenty years ago. I actually DID do artwork for my high school yearbook. I actually DID paint posters and banners for school pep rallies. I actually DID win an award for my artwork when I was a senior at Leeds High School. Now when I try to draw or sketch I get frustrated when I can't create art quickly! I must say though that I am actually reading the book on PhotoShop and feel somewhat good about my efforts there. I did figure out what part of the problem might be. I expect these things to come too easily. I usually get in to work about 7:00am. It's dark during the winter months when I go in. I usually don't leave work until after 6:00pm. It's dark during the winter months when I get off. Add the thirty minute trip each way and that's 12 hours a day. And I don't even want to talk about the weekends when I usually try to go in to catch up a bit (although I do that less these days also). By the time I get home, watch the news, and have dinner it's about 8:00pm. Two hours to study or play then it's off to bed by 10:00pm (except for tonight; it's 10:34 and I'm still up). So....my revelation? You have to make time for yourself! Decide what's important, what makes you feel good about yourself, make time for it and realize that anything worth having requires a bit of work. You have to give yourself a little kick on occassion just to get motivated. Well, that's my rant for tonight. Guess I'll hit the sack right after I think up some new projects to start! I think we have alot in common. I also bought a keyboard a few years ago and never learned to play it, though I would love to. I have several neat software programs, such as Screenblast! Movie Studio - I've made one "video". I wish I had the time to play around with it, it's pretty neat. And, I just got a bass guitar for Christmas because I'd really love to play like Kaz - we'll see. Playing bass like Kasim Sultan? That would be so cool would it not? I have several music composer programs and listening to the samples that come with them almost make me think that I could make music like Todd Rundgren..now if I just actually could write music!! I had a comic I drew 13 years ago. It was a little comic about my master plan to get a comic series going. According to this plan, I would draw a tier a day, get 2 pages a week done and still take Sunday off! When I looked at it a few weeks ago, I was amazed that 13 years had flown by. I was going to print this little 13-year old comic in my new book, but I am flip-flopping on that idea now. In fact, I may have lost it. a. ONE page a week. I'm with Janet. Stay out of the tree. Leave that to the experts, or the idiots. Don't listen to these other guys about staying out of trees. There are fewer activities for satisfying that looking at a stump that you created and then staying warm with it over the long dark winter. Just make sure you have the right equipment. Remember, trees can bounce and chainsaws can dismember.